Following up on a successful launch of the 2019 Ram 1500, Ram Trucks has focused its engineering efforts on revamping its heavy-duty lineup of trucks. The 2019 Ram Heavy Duty lineup has some of the most advanced features found in any pickup truck, and the power and performance to back it all up. We went to the remote desert areas outside of Las Vegas, near the Colorado River, to put these new rigs to the test. Throughout the day we spent time in the whole lineup, including a diesel-powered 2500 on the road, a Power Wagon off-road and a 3500 Cummins dually for max towing. 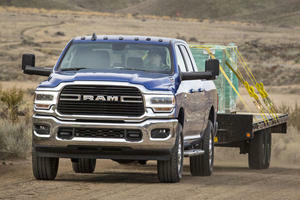 Will the 2019 Ram Heavy Duty meet the ridiculously high bar set by the new half-tons? Unlike Chevrolet, who made a bold design choice with its new big trucks, Ram kept the looks similar to the half-ton. Gone is the crosshair grille, replaced with R-A-M lettering on all models. The new grille is wider, too. Partially to improve airflow but also to create a more imposing presence on the road. All models get new headlights, with many models receiving upgraded LED units with accent lighting. On the Laramie Longhorn and Limited models, the LED lights are curve-adaptive, too. Most of the trucks also feature rear LED lighting. The regular cab returns, along with a four-door extended cab and the absolutely massive Mega Cab. You could hide a Zeppelin in the back and not be able to find it. Different bed lengths are also available depending on what work you’re trying to get done. For those who need the maximum towing or payload,dual-rear-wheel trucks are optional. The backup sensors even protect the fenders on the dual-rear wheel models. The standard engine in Ram Heavy Duty is a 6.4-liter HEMI V8 making 410 horsepower and 429 lb-ft of torque. It’s also the only engine available on the off-road brute Power Wagon. Buyers can opt for a Cummins turbodiesel I-6 that makes 370 horsepower and 850 lb-ft of torque. Though if you really need the grunt, there's a high output Cummins available on the 3500 that boosts output to 400 horsepower and 1,000 lb-ft of torque. That’s a torque number that requires a comma and is a lot. When equipped in a regular cab 3500 dually with the proper towing package, the Ram 3500 can tow 35,100 pounds or 7,680 pounds of payload when equipped properly. That towing number is currently best-in-class, at least until the Silverado HD goes on sale with its 35,500 pounds of towing. Trucks with the gas engine get a new ZF-sourced 8-speed automatic transmission, while the diesel versions have a new version of the 6-speed AISIN automatic. The manual transmission offering that used to appear is officially dead for the 2019 models. The EPA doesn’t require fuel economy testing on these types of trucks, but the new trucks should be a bit more efficient than the outgoing models, thanks to the new transmissions and lighter-weight materials. The interior of the Ram Heavy Duty is what makes it really stand out from the competition. Everything you see is real. If it looks like metal, it’s metal. If it looks like wood, it’s wood. Everything you touch is a soft material of some kind. Standard is a 5-inch Uconnect system, but most models will have the 8.4-inch model or the new 12-inch touchscreen that debuted in the half-ton. For those who opt for the big screen, they get access to SiriusXM 360L, which includes on-demand content and a system that learns what you like and adapts to it. Both the 8.4-inch and 12-inch screens support Apple Car Play and Android Auto. Gasoline models lose the column-mounted shifter and get a new rotary dial unit. The diesel models still have the column-mount. New safety features make its way to the Ram Heavy Duty, including blind spot monitoring, lane keep assist, and adaptive cruise control that works with a trailer attached. Autonomous emergency braking will also help you avoid a collision and is designed to take the trailer you’re towing into consideration when braking. On the Mega Cab, the rear seats have available heating and they can recline. Wireless charging is available, and tons of USB-A and USB-C ports are littered throughout the cabin. Optional upgrades also include a 750-watt, 17-speaker Harman Kardon stereo system. Silverado and Sierra HD have the title for most bed volume on a heavy-duty pickup, with their DuraBed increasing cargo box volume by 14% on the standard bed and 9.5% on the long bed. That is a total of 83.5 cubic feet on the Silverado HD long bed. Ram’s long bed only has a total of 74.7 cubic feet of volume, but Ram does offer something that GM does not. That feature is called RamBox, and it’s a lockable, sealed and drainable storage that buyers can add to the truck. RamBox is a $1,295 option on the current truck, and even though pricing hasn’t been announced for the option on the new truck, we don’t expect it to change much. It includes a 115-volt 3-prong outlet for powering tools and accessories and is locked by the key fob or pressing the remote access button on the RamBox door itself. Interior volume of the RamBox is 8.6 cubic feet and is the equivalent of approximately 140 beverage cans. With ice, that number would be less. Inside, the regular cab model has 62.5 cu-ft of overall space. The crew and Mega Cab models each get 63.9 cu-ft up front, but the crew cab also gains 60.7 cu-ft in the rear while the Mega Cab gets 66 cu-ft in the rear. Ram says total storage in the Mega Cab is an impressive 258 liters. On the crew cab and Mega Cab models, there are under seat storage bins that are lockable. The center console is large enough to hold a laptop computer and is designed to support hanging file folders. The HD models also have two glove boxes. A button on the dash pops open the top one, and the bottom one opens like a traditional glove box. Most people tow or haul with a heavy-duty truck, but that doesn’t mean that Ram hasn’t gone great lengths to improve the unloaded ride quality of the truck. While it’s not as smooth as the 1500, living with a 2500 or 3500 day-to-day wouldn’t be an exercise in masochism. The opulent interior and driving aids also help improve the comfort of the long haul. When attached to a 40-ft trailer weighing 22,000 pounds heading up a 5-percent grade, the Ram 3500 with the High Output Cummins takes everything in its stride. For towing beginners, it might seem frightening to have to keep your foot to the floor to maintain speed, but as hard as the truck is working it doesn’t feel like it is. Even attached to the trailer, the AISIN’s shifts are smoother than ever. Shifts are nearly imperceptible, which is a huge improvement over the older trucks. Even though the competition is going to 10-speed transmissions on their big trucks, the 6-speed in the Ram seems to hold its own. Hooking up a trailer is a piece of cake with all the available cameras on the Ram Heavy Duty. The tailgate camera has a zoom function. The Center High Mounted Stop Lamp (CHMSL) camera even has a line on it to show you where the 5th-wheel or gooseneck hitch is. Side view cameras make it easy to see what’s both beside you and behind you. You’re still backing the trailer up yourself, but you have visibility at all angles that you never had before. The only thing that might make backing a trailer up easier would be something like Ford’s Pro Trailer Backup Assist, which isn’t even on their Super Duty trucks until the refresh hits the market later this year. The Power Wagon is still the most capable pickup truck you can buy. It retains the front and rear lockers, the electronically-disconnecting sway bar, the manual transfer case, and the winch. It does get a new version of that winch using a synthetic cable instead of steel. This means it won’t kink and it’s safer if it breaks. It still has the 12,000 pounds of capability, though. Power Wagon also comes with many of the interior niceties as other models, including the 12-inch screen as an option. For those who want the Power Wagon but don’t want the flashy graphics, you can order it as a package on top of the Tradesman trim. You still get all the off-road technology, including the winch, but you’re flying a bit more under the radar. 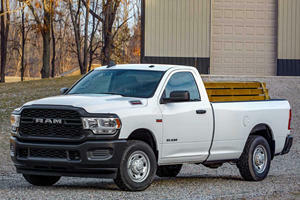 The new Ram Heavy Duty is currently the best heavy-duty truck on sale. Competition this year will be fierce, with updates from Ford, Chevrolet and GMC. But for right now, the Ram is easily king of the hill. Being that the truck is new, it’s unlikely that there’ll be many problems. The 8-speed automatic in the gas versions has been used in other products, so there is no real worry there. The Cummins name also carries a lot of credibility in the truck world, and major issues would be unlikely. The Ram HD starts at $33,395 plus a $1,695 delivery fee. To add the regular output diesel, expect to pay an additional $9,100. 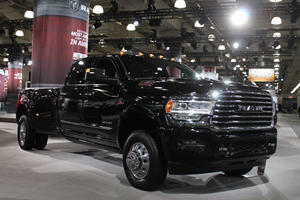 For the High Output engine, the one with the 1,000 lb-ft of torque, expect to add $11,795 to the price of a Ram 3500. 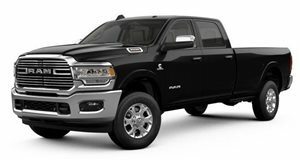 On the other end of the spectrum, the Ram 3500 HD Limited with four-wheel drive, the Mega Cab, and the 12-inch Uconnect screen starts at $67,050 before destination. The Power Wagon starts at $52,900 before destination. All of the trucks will be on sale later this year. The new lineup of Ram HD pickups raises the standard for all heavy-duty trucks by offering impressive capability with refinement and comfort. Buyers no longer have to make sacrifices to creature comforts for increased towing and hauling. Like the Ram 1500, the 2500 and 3500 will be the standard that other truck makers will be trying to match over the coming year. You don't need leather trim to get 1,000 lb-ft of twist.